In the last couple of years, some of them have proven to be more than useful and I am more than happy that I collected them for my hiking trekking trips based on one or other experiences By the way, I do not trek or hike much but I have hiked enough to appreciate the importance of these items as a novice or mediocre. I am sure pro-trekkers or pro-hikers may have more sophisticated lists of important items to carry. However, if you are starting your trekking or hiking trips and getting used to this hobby, this list will certainly help you quickly start the learning process. Let’s check out first the most important items that we all must carry while going for a hiking or trekking trip. Your treks or hikes will become less worrisome to some extent when you don’t have to care about basic items of survival in temporary adverse conditions. 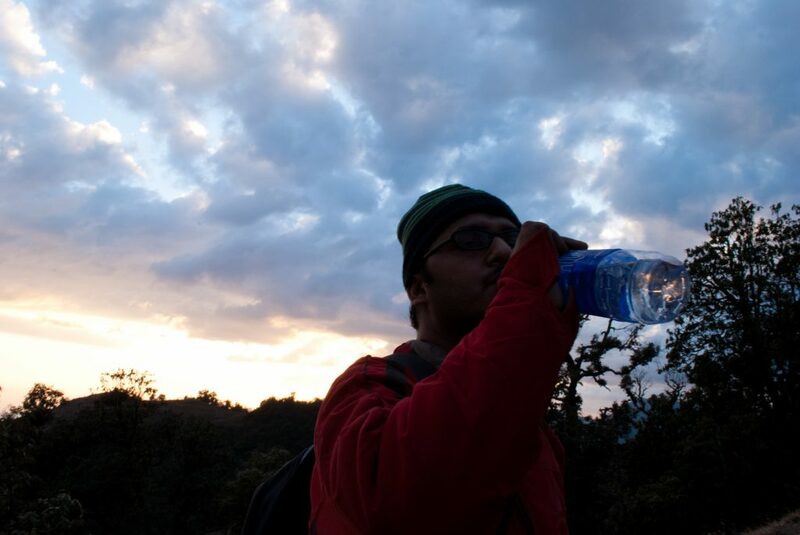 No need to stress the fact that a water bottle is nothing but a very precious thing to have on any hiking or trekking trip. When you are hiking, your body dehydrates but most times due to cold or cool temperature, you do not realize you are sweating. Hence, sipping water from your bottle frequently will keep you hydrated. I have been to a couple of treks where I did forget to carry a water bottle only to curse myself in the middle of it. One bad experience was my trek to Chandratal Lake and the other one the Prashar Lake. You should always carry a water bottle and refill it whenever you get a chance from natural streams. Buy a sturdy water bottle that does not leak or break by falls. I have been using these Contigo ones but you can also go with similar models from like Milton or Quechua ones available at Amazon or other e-commerce websites. It will not only keep you hydrated always but you will also help in saving the Himalayas from plastic garbage and carry not much load of water while trekking or hiking. Remember, every tiny step counts and you can help save the mountains keeping the plastic waste in check !! When you are hiking or trekking, you lose energy much faster than you anticipate. Munching few things every now and then will keep your energy level optimum. I always carry a mix of items such as a pack of trail mix, some dry fruits or nuts, few chocolates like Snickers or you can carry some energy bars too. The advantage of carrying these munching items is that they take less space and easier to carry than too much of real food without worry about spillovers. A good daypack or a backpack always helps you keep your things well organized on any hike or a trek. There is a wide variety of backpacks available. I own a couple of North Face backpacks and Quechua rucksacks which are quite comforting on my shoulders and balances the loads evenly. They also provide easy access to items and keep them organized better. I have used some cheap quality backpacks too in the past but always felt them either burdening or bruising. I will recommend investing in a good backpack or a daypack which will help you feel light and less sweaty on the back. A good backpack or daypack must protect your gear or items from at least light rain/snow and also provide easy access or organization of your items. Well, you will be surprised to know that this little piece of handy toolset called Swiss Knife has proven to be handy in more situations than I remember now. It has proved very helpful in not just my hiking or trekking trips but for all kinds of trips. I own a Victorinox Huntsman Red Swiss Army Knife for last 6-7 years and it still works like a charm. In case it gets late or dark while coming back from the day’s hike, a torchlight or flashlight can prove to be a lifesaver. I still remember the horrors of my trek to Triund and Laka Glacier where it got pitch black by the time we were a KM away from our camps. It proved to be a life-saving ordeal in the absence of torchlight. Your hands will keep coming in contact with unwanted spots either by falling or climbing or looking for support when you are on a hike or a trek. Hand sanitizers will help keep a check on germs and help reduce the probability of getting sick while on a multi-day trek or after coming back from a day’s hike on the nearby trail. Since I got infected on my Spiti Valley trip in 2014, I always carry hand sanitizer on all my trips. I use it often enough now even for no reason at times. Similar to a good pair of trekking shoes, I believe that one must own a comfortable, breathable, cargo styled and quick dry trek pants or trousers (preferably). In case you are planning on snow trek, you can opt for trek pants which offer built-in gaiters to get required snow protection. Quick dry capabilities prove very satisfying in the situations of crossing water streams. Also, a good number pockets on cargo styled trek pants help keep other things like eateries, swiss knife, etc.. handy for you while you hike. Whenever hiking or trekking in open, you should always protect yourself from the direct exposure of skin to the sun. Sometimes the sunburn can be really bad and if you are too much into hiking and trekking then buying a cap or hat will help you in a long way. You must protect yourself from UV rays and direct sunlight, especially while traveling or trekking/hiking in places in Ladakh or Spiti Valley where the intensity of sun rays are far more impacting than normal cities. I always use sunscreens with SPF 70 or more as I have seen some really bad cases of sunburns which proved very painful for quite a few days after the trip. You can also carry lip balms with SPF rating to protect lips getting sunburn. You should always keep a hard copy of the map of your trekking trail or route. We know cell phones have GPS but many times you will find yourself a spot where these phones do not work or run out of battery. This especially true for the long-running hikes or treks. A dedicated GPS device with trail map loaded will still be worthy when it comes to gadgets but a hard copy may always prove to be contingency plan just in case you run out of luck. Last but not the least, you must carry basic medical kit with creams for burns, bruises, antiseptic lotions, bandages, bandaids etc.. You never know when small medical first-aid kits may help you or a fellow hiker or trekker with minors health issues including burns, cuts or bruises.